‘Tis the season of being busy. This weekend marks the start of holiday shopping season and holiday party season. But just because you’re busy doesn’t mean you have to default to your same old everyday hairstyle to your next holiday party. Even if you’ve got only a few minutes to get ready, these five super-easy hairstyles will elevate your holiday-party look. So quick, they can practically be done as you’re running out the door! Look, let’s get serious. The ponytail is your go-to for a reason. A ponytail can be pulled up into a high, sleek ‘do that brings out your inner boss-babe. Or you can leave it low and loose, winding in small braids and accessories. Or make it tousled and layered. You can even twist or knot your pony, like this style from The Beauty Department. Add a pouf to the top of your hair to add retro drama and volume to your ponytail. Or, to try something a little different with your pony, check out the dual-purpose ribbon style further down in this post. This simple side-swept style from Hello Glow looks chic on short- to medium-length hair. This updo looks elegant and dramatic, but could hardly be simpler. Sweep over hair from the top half of your head, pulling it slightly beyond the middle of your head, and pin it to the side with a bobby pin. Then, grab a section of hair below the first one and twist. Secure the twisted hair just beyond the first section, covering the first bobby pin. Repeat, twisting another section of hair, bringing it a little farther around your head than the first piece. Then, pin the second section. Continue, grabbing lower sections of hair, overlapping the previous ones slightly as you bring the hair across the back of the head. When finished, pin any remaining stray pieces into place and spray with hairspray. The editors at Hello Glow recommend pairing this look with a bright red lip for added vintage flair. This low chignon style looks sophisticated and elegant but is really a hair hack that takes five minutes or less. Start with two stretchy headbands. Slide on one to hold back your hair at the hairline around to the nape of your neck. Then slide on a second headband so that it’s partly over your forehead. This second band should lie on top of your hair so that it’s visible all the way around your head. This second headband is what will hold your hair when it’s tucked. Choose a second headband that has sequins, beading or metallics to step up the party mood with this style. Grab a one to 1 ½-inch section of hair on the left side, and roll it up to the headband. Tuck it into the band and pull the strand tight so the ends stick out. Next, pick up a one-inch section and combine it with the tail of the previously tucked strands, rolling it up and into the headband. Pull the strand tight again, letting the ends stick out. As you go, re-tuck pieces that loosen and become untucked from the headband. It can be helpful to alternate sides, tucking a strand on the left, then a strand on the right, and working your way towards the middle of your head. Repeat the process until you’ve added all your hair to the tails of the previously tucked strands. To finish, slide the second headband farther back onto the top of your head until it covers the first headband and hides it. When complete, all your hair should be wrapped up and tucked into the band. You can cover too-short strands with the hair loops. Finish the look with hairspray. Bonus: this style works best on two- or three-day dirty hair because freshly shampooed hair tends to slip out of the bands more easily. You can find more variations on the “tuck and cover” on the blog, MissySue.com. The secret to a perfectly shaped, elegant bun? A sock. Yep, all you need to do is cut off the toes of an old (clean!) sock. Then roll the sock into itself until it forms a doughnut shape. Secure your ponytail at the crown of your head, and use hairspray to hold all stray hairs in place around your face for a sleek look. Then, hold the doughnut above your head at the end of your ponytail. Insert the ends of your ponytail into the doughnut hole and slowly, evenly wrap the hair in the ponytail all the way around the sock. 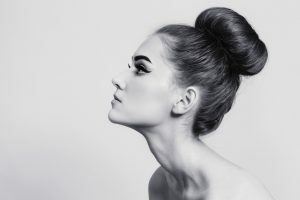 Move the sock down the length of your ponytail, continuing to wrap as you go, until you reach your scalp and the ponytail is entirely wrapped around the sock, and no sock material is visible. Secure the bun with bobby pins and spray with more hairspray. Voila! You have a perfectly rounded and elegant top bun. This edgy but pretty trick by hair guru Kristin Ess is the ultimate last-minute hairstyle. This dual-purpose choker-ponytail look works best for longer hair that is pin-straight, wavy or naturally curly. First, take about two yards of ribbon that’s one-quarter-inch wide and tie it “around your neck loosely like a choker, then wind it around your ponytail,” Ess tells Allure. “Not only is this a cheap and chic style, but you get two accessories out of it.” For added drama, choose a velvet or luxe satin ribbon in a darker color like black or deep burgundy.